2011 & 2010 BSA Centennial Quality Unit Award. The Centennial Quality Awards program is designed to recognize units, districts, councils, areas, and regions for achieving excellence in providing a quality program to a growing youth population in America at all levels of the Boy Scouts of America. 2011 D-bar-A Scout Ranch AwardsLonghorn Award: Troop 3 was awarded the Longhorn Award by participating in the most activities among 6 other troops while at camp. The Bobcats, Dragons, and Rattlesnakes earned the Baden-Powell Patrol Award by completing requirements in: patrol spirit, participation, advancement, service and leadership. Lockwood Invitational: Troop 3 won this Friday Afternoon Camp-wide Water Carnival featuring the 12 person War Canoe showdown and the 5-event Lockwood Relay beating out 6 competing troops. 2011 1st Place Against All Odds - Bobcat Patrol. A special award for crediting the young scouts competing against older patrols comprising older scouts. 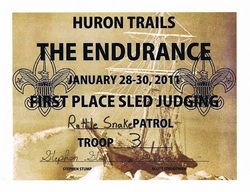 2011 1st Place Sled Judging - Rattlesnake Patrol. The Rattlesnake Patrol's sled entry had the unique grocery cart as it's base. 75 frogs involving it's full membership of 13 scouts.